Membranes are the kidney and liver of water treatment systems. They filter out all the contaminants and particles from the feed water source once it has passed through pretreatment. Crossflow membrane filtration is a pressure-driven separation process. Application: Industrial, food, water, chemical, and biotechnology markets, as well as for those providing environmental protection. RO membranes are great solutions for many different applications. Membranes serve as highly-engineered, physical barriers that permit the passage of materials only up to a certain size, shape or character. 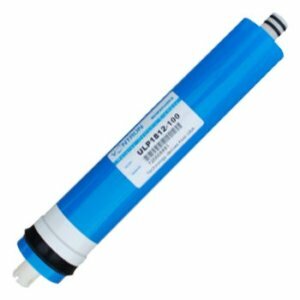 Puritech offers reverse osmosis membranes (RO membranes), Filmtec membranes or Dow Filmtec membranes, Koch membranes, and Hydranautics membranes in a variety of configurations, materials and sizes; each designed to meet specific application needs. Puritech also stocks their brand of spiral membranes. 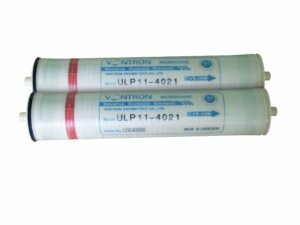 There are four main membrane separation processes currently employed for liquid/liquid and liquid/solid separation: microfiltration (MF), ultrafiltration (UF), nanofiltration (NF) and reverse osmosis (RO). 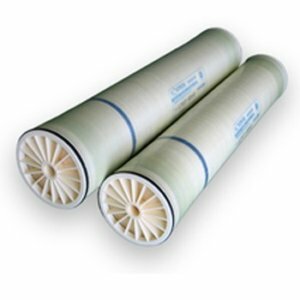 Spiral wound products have become the most commonly used membrane for industrial water applications such as boiler make-up water, brackish water treatment, seawater desalination, microelectronics and pharmaceutical water applications. 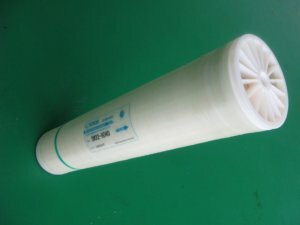 These membrane are available as UF, NF and RO. Semi-permeable membrane refers to a membrane that selectively allows certain species to pass through it while retaining others. In actuality, many species will pass through the membrane, but at significantly different rates. In RO, the solvent (water) passes through the membrane at a much faster rate than the dissolved solids (salts). The net effect is that a solute-solvent separation occurs, with pure water being the product. (In some cases, dewatering is desired to concentrate the salts). Osmosis is a natural process involving the fluid flow of across a semi-permeable membrane barrier. Consider a tank of pure water with a semi-permeable membrane dividing it into two sides. Pure water in contact with both sides of an ideal semi-permeable membrane at equal pressure and temperature has no net flow across the membrane because the chemical potential is equal on both sides. If a soluble salt is added on one side, the chemical potential of this salt solution is reduced. Osmotic flow from the pure water side across the membrane to the salt solution side will occur until the equilibrium of chemical potential is restored. In scientific terms, the two sides of the tank have a difference in their “chemical potentials,” and the solution equalizes, by osmosis, its chemical potential throughout the system. Equilibrium occurs when the hydrostatic pressure differential resulting from the volume changes on both sides is equal to the osmotic pressure. The osmotic pressure is a solution property proportional to the salt concentration and independent of the membrane. Puritech is a wholesale distributor of reverse osmosis membranes (RO membranes), Hydranautics membranes, Filmtec membranes (Dow membranes), Koch membranes, Toray membranes. We maintain great professional contacts with the water industry’s top membrane manufacturers. 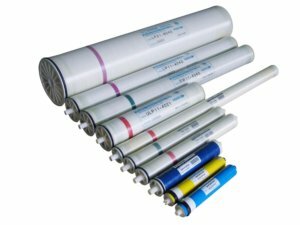 We supply elements from many of the major manufacturers and for your convenience, we stock Dow/Filmtec and Hydranautics membranes. This enables us to meet short lead times and thereby minimize your system’s downtime. 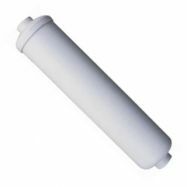 We have been using and distributing these name brand membrane for many years, and we use nothing but the best membrane for our reverse osmosis and desalination systems. Have any problem with one of your System membranes?